Home DIY Projects	Credenza turned into Media Cabinet! Happy Tuesday, friends! My husband and I have been in full blown Christmas decorating mode. Wreaths hung? Check. Tree? Check. Meanwhile, we are doing a few DIY projects around the house, too. 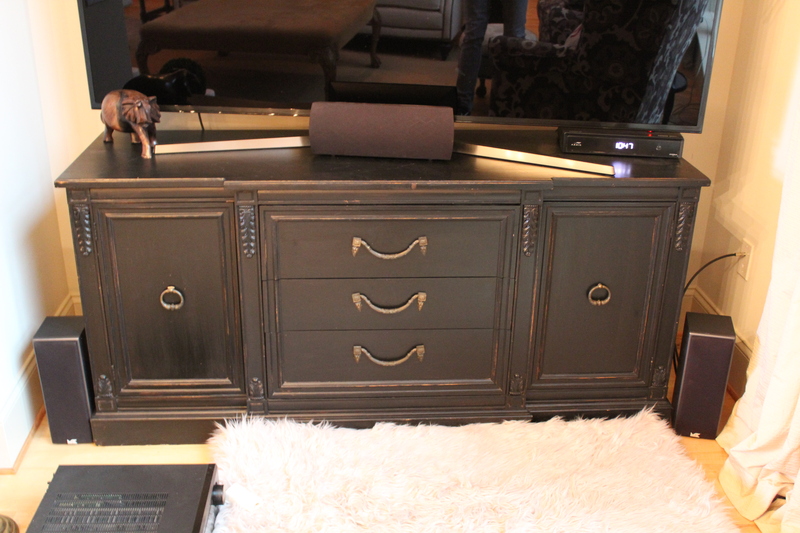 Come see how we turned a credenza into a media cabinet for our television! We’ve had this black credenza for several years. In our last house, it was in my husband’s office and served as a place to store files, office supplies and samples. Because this house is smaller, we’ve had to rethink some our our favorite pieces. In some cases, they simply don’t fit. But others, like this piece, we repurposed as a media storage cabinet for our great room. This is how it looked from the start. We decided to take out a drawer or two in the center in order to house components such as a receiver and a center speaker. After we took out two of the drawers, we thought it looked awkward with one drawer remaining on the bottom. So we decided to remove all of the drawers. Once gone, my husband removed the drawer glides from the center of each space. He also added a thin piece of ¾” wood trim to the front edges of the shelves for a more finished look. Then he painted the insides of the cabinet black. And here is the after picture. We put the speaker on the bottom because the middle shelf was too small. Plus, we wanted the receiver on the top so it is easier to reach. (We are getting older, so convenience is key!) That left the middle shelf for the (crazy and still necessary) cable box. This console fits perfectly in the recessed nook between the fireplace and the outer wall. And the big screen TV takes up every inch of real estate on this piece of furniture. A perfect fit for both. And, it allows the tv to sit beside the fireplace. Personally, I’m not a fan of the tv over the fireplace. That’s just me. Now the top of the media console is more streamlined without the clutter of the components. One more project off of our list! Now we are ready to watch our favorite Christmas shows when our children come. And we will have surround sound and Christmas tunes throughout the house speakers! Ready, Santa! This project took the better part of a day. Naturally, it involved a few trips to Lowe’s for the wood strips, wood glue, etc. But for less than $10, we were able to use paint we had on hand, and convert this old console into a new media center! Now it much better suits our space. The paint had to cure for about 12 hours until it was no longer tacky to the touch. My husband cut holes in the lower back portion of each shelf so the wires could feed through to the back. And because we have two doors on each side, there is still plenty of storage in this piece even without the 3 drawers.